Interior of the Apollo Command Service Module on display at Kennedy Space Centre, Florida. Fuel cell tank exploded en route to the moon, resulting in loss of all power and oxygen. Only through use of the still-attached LM as a lifeboat could the crew survive to return to earth. Altitude (401,056 km) record. AKA: Odyssye/Aquarius. Launched: 1970-04-11. Returned: 1970-04-17. Number crew: 3 . Duration: 5.95 days. Location: Kansas Cosmosphere and Space Center, Hutchinson, KS. Preparations for the launch proceeded without major problems through February and March 1970. Three days before launch, Jack Swigert took Ken Mattingly's place as command module pilot, after the prime crew had been exposed to German measles and Mattingly was found to have no immunity. Apollo 13 lifted off on schedule at 2:13 p.m. Eastern Standard Time on April 11, and for two days operations were routine; Capcom remarked at one point that flight controllers were bored to tears. A few hours later, however, an oxygen tank in the service module ruptured, depriving the spacecraft of most of its electrical power and oxygen, and the mission had to be aborted. Only a heroic effort of real-time improvisation by mission operations teams saved the crew. 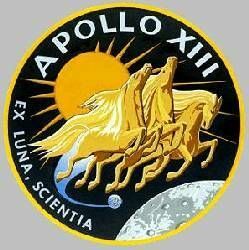 Almost lost in the drama of the mission was the one piece of scientific information that Apollo 13 was able to provide. Shortly after command module pilot Jack Swigert had extracted the lunar module from atop the S-IVB stage, ground controllers fired the auxiliary propulsion system on the big rocket, putting it on a course to crash into the moon. 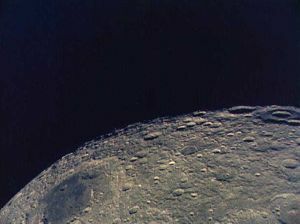 Three days later the 30,700-pound (13,925 kilogram) hulk struck the lunar surface at 5,600 miles per hour (2.5 kilometers per second) some 74 miles (119 kilometers) west-northwest of the Apollo 12 landing site, releasing energy estimated as equivalent to the explosion of 7.7 tons (7,000 kilograms) of TNT. Half a minute later the passive seismometer left by Apollo 12 recorded the onset of vibrations that persisted for more than four hours. Another instrument, the lunar ionosphere detector, sensed a gas cloud that arrived a few seconds before the seismic signal and lasted for more than a minute. Seismologists were baffled by the moon's response to shock, but welcomed the new means of generating data. In the year that it took to discover and correct the cause of the Apollo 13 failure, the scope of the remaining missions was altered. 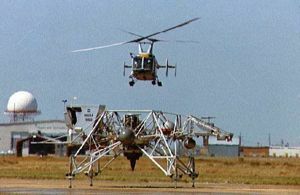 Apollo 14 would visit the site intended for exploration by Apollo 13, but it would go there as the last of the intermediate exploration missions. Family: Manned spaceflight. People: Haise, Lovell, Swigert. Country: USA. Spacecraft: Apollo CSM. Projects: Apollo. Launch Sites: Cape Canaveral. Agency: NASA Houston. 1968 October 23 - . 1969 November 4 - . Thermometer to read lunar surface temperature considered for Apollo 13 ALSEP - . Nation: USA. Program: Apollo. Flight: Apollo 13. Spacecraft Bus: Apollo LM. 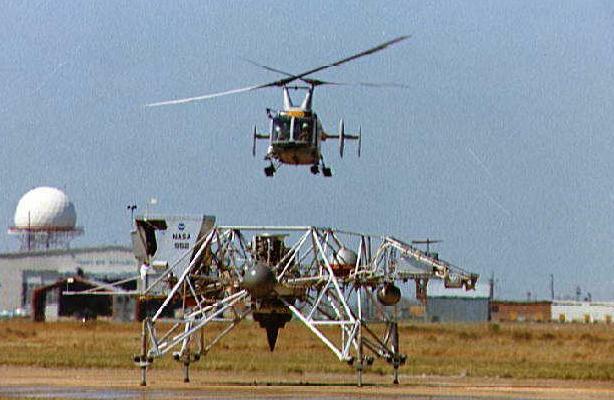 Spacecraft: Apollo ALSEP. Provision of a thermometer that could be attached to the ALSEP for the Apollo 13 mission, to take a reading of the lunar surface soil temperature, was being considered at MSC..
1970 April 6-10 - . 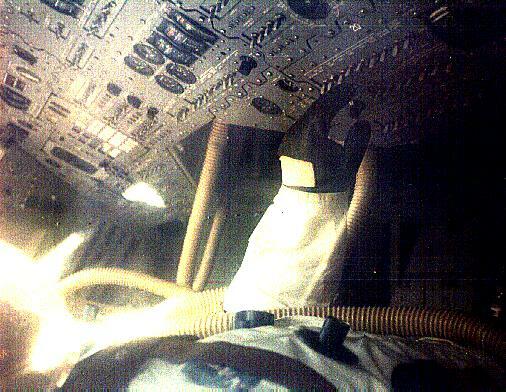 Swigert, Apollo 13 backup pilot, began intensive training to replace Mattingly - . Nation: USA. Program: Apollo. Flight: Apollo 13. Spacecraft: Apollo CSM. 1970 April 13-June 15 - . Apollo 13 - "Hey - we've got a problem here" - . Nation: USA. Program: Apollo. Flight: Apollo 13. Spacecraft: Apollo CSM, CSM Electrical. 1970 April 17 - . Apollo 13 Review Board established - . Nation: USA. Program: Apollo. Flight: Apollo 13. NASA Hq. established an Apollo 13 Review Board to investigate the Apollo 13 accident.. Landing of Apollo 13 - . Return Crew: Haise, Lovell, Swigert. Nation: USA. Related Persons: Haise, Lovell, Swigert. Program: Apollo. Flight: Apollo 13. About four hours before reentry on April 17, the service module was jettisoned and the crew took photographs and made visual observations of the damaged area. About one hour before splashdown the command module was powered up and the lunar module was jettisoned. Parachutes were deployed as planned, and the Odyssey landed in the mid-Pacific 6.4 kilometers from the recovery ship U.S.S. Iwo Jima at 1:07 p.m. EST (18:07 GMT). The astronauts were picked up by helicopter and transported to the recovery ship less than an hour after splashdown. 1970 April 17 - . 18:07 GMT - . Safe splashdown of Apollo 13 - . Nation: USA. Flight: Apollo 13. 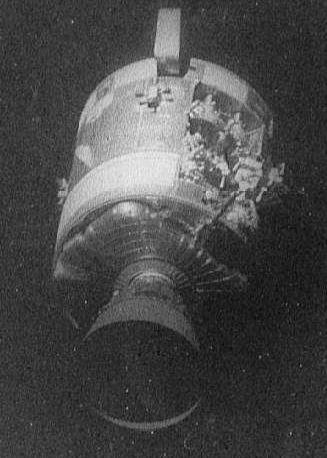 About four hours before reentry, the service module was jettisoned and the crew took photographs and made visual observations of the damaged area. About one hour before splashdown the command module was powered up and the lunar module was jettisoned. Parachutes were deployed as planned, and the Odyssey landed in the mid-Pacific 6.4 kilometers from the recovery ship U.S.S. Iwo Jima at 18:07 GMT April 17. 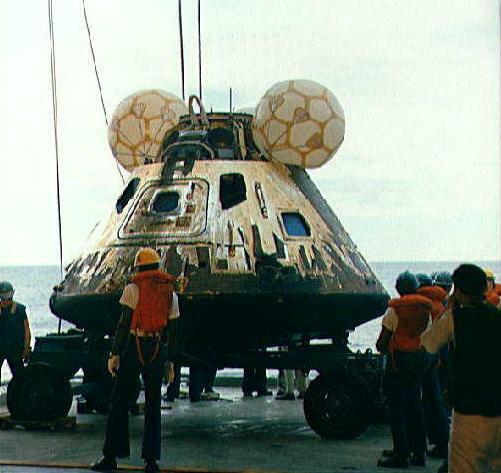 The astronauts were picked up by helicopter and transported to the recovery ship less than an hour after splashdown. 1970 June 13 - . Apollo 13 Review Board publishes result of investigation. - . Nation: USA. Flight: Apollo 13. 1970 June 26 - . 1970 July 14 - . Apollo 13 investigation personnel redirected to the Apollo-experience-reporting project - . Nation: USA. Program: Apollo. Flight: Apollo 13. 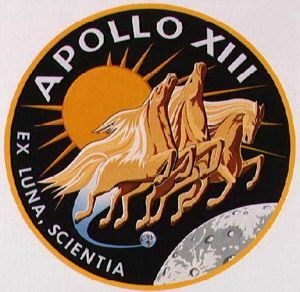 Efforts of MSC personnel that had been redirected to support the Apollo 13 investigation would again be concentrated on the Apollo-experience-reporting project in an effort to attain a publication date of November 1, 1970..
Reassessment of all Apollo spacecraft subsystems - . Nation: USA. Program: Apollo. Flight: Apollo 13. MSC moved to reassess all Apollo spacecraft subsystems and the engineering organizations responsible for them at MSC and its prime contractors, in response to Apollo 13 Review Board recommendation 9..
1970 November 24 - . Television version of Apollo 13 mission - . Nation: USA. Program: Apollo. Flight: Apollo 13. Universal Studios filmed a program for the ABC TV Network entitled, "Houston, We've Got a Problem." Although fictitious, the show revolved around mission control and the flight controllers during the Apollo 13 mission. The production was televised March 2, 1974. 1995 June 30 - . Apollo 13 motion picture is released. - . Nation: USA. Flight: Apollo 13. Ron Howard's cinematic version of the Apollo 13 mission is released. Tom Hanks, Bill Paxton, and Kevin Bacon portray the crew with Gary Sinise as the grounded Mattingly and Ed Harris as flight controller Gene Kranz. The film grosses $ 334.1 million worldwide and reawakens popular awareness and interest in the space race of the 1960's.